The Premium Edition includes the following features! Over 2800 items in the default list to select from and the ability to add others if your item is not in the list. Ability to add your custom images for each item in your inventory. Ability to save your personal information and insurance agent's information in the database and it prints on the reports. Ability to save your "Insurance Values" in USD or in your local currency. Several insurance reports are available. Online Help and a User's Guide. Technical support directly from Star Track Software. crystal images for the items in both the Silver Crystal Book and Beyond Silver Crystal Book that display on the screen. Images provided by Warner's Blue Ribbon Books on Swarovski. 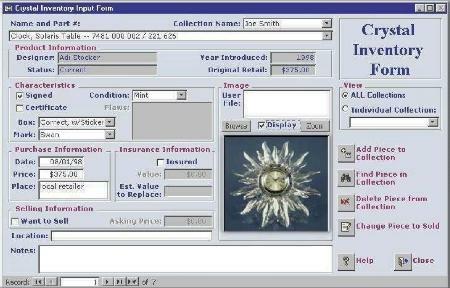 Star Track Software runs on IBM-compatible pc's. It works under the following operating systems: Windows 2000 (with Service Pack 3 or later) or Windows XP or Windows Vista. Star Track Software requires a PC with a Pentium class processor, 500MHz or higher, and 256MB RAM. Hard disk requirements are 100MB for the Deluxe Package and 800MB for the Premium Package (assuming you need Microsoft Access 2007 installed). You need a SVGA monitor with 1024 x 768 resolution or better. Your printer must have the correct print driver installed to preview and print reports. Star Track Software is no longer sold or supported.